I really liked drawing the 1st panel cause I was "kinda" able to draw all 7 of the human chosen together. Though only in silhouette it was still a nice feeling. And below that are 6 of the 7 chosen grands and their chosen abilities in case someone didn't figure them out back in issue 1-0. NO!! It's S...want me to keep going? I know where you live and I will destroy you! Just starting back. It's great to see you here MIB! It wouldn't be the same without you! 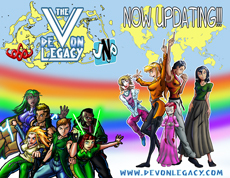 Right now I'm uploading the Prologue on here daily while making new pages of Devon Legacy Proper. I hope to get both sides of the 1st issue done before I run out of buffer here! He looks pretty cool though.